Several people asked about the crock pot turkey we had on our menu for last Sunday’s dinner. Using the crock pot makes it a great meal for after church on Sunday. Easy and delicious. 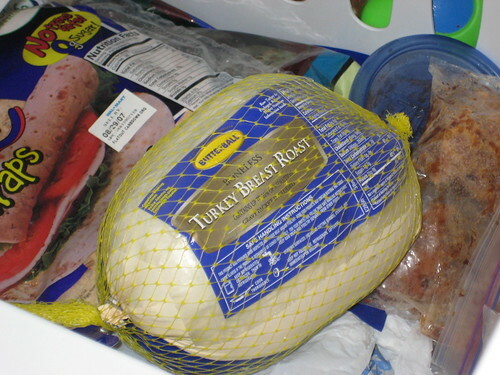 I use a boneless turkey breast (or a boneless “whole” turkey with dark and light meat) which can be found in the frozen section of the grocery store. If I want to cook it on Sunday, I take it out of the freezer and put it in the fridge on Thursday so it has time to thaw. A frozen bone-in turkey breast can be cooked in the same way. A whole chicken would work fine, too. DH put this is in the large crock pot where it looks rather lost. When I make it, I use the smaller one. The roast comes with a gravy packet which I wash and store in the fridge until needed. The turkey also comes with a net around it, which is supposed to be left on while it cooks. I always remove it because it’s much harder to remove after the turkey has cooked. 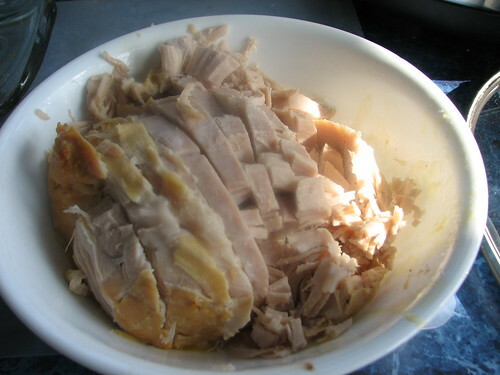 I add a can of cream of chicken soup to the turkey and cook it on high for four hours. It can be cooked on low for eight hours, if that suits your timing better. Sliced and ready for the table. This is moist and delicious. I served it with mashed potatoes (DD’s absolute favorite), stuffing (*my* favorite), corn, peas, and Ceasar salad. This entry was written by ~~Rhonda, posted on February 9, 2009 at 9:36 pm, filed under cooking and tagged crock pot turkey. Bookmark the permalink. Follow any comments here with the RSS feed for this post. Post a comment or leave a trackback: Trackback URL. I went to the store today and bought the stuff to make this! I cannot wait to try it! I taste tested for Rhonda on Sunday and confirm it was yummy !!! I made this Friday and it was SO GOOD! I accidentally bought a savory herb flavored turkey breast, but it turned out GREAT! I liked the extra flavor! Also, made a huge pot of mashed potatoes! YUMMY! This will definitely be going on the menu rotation! 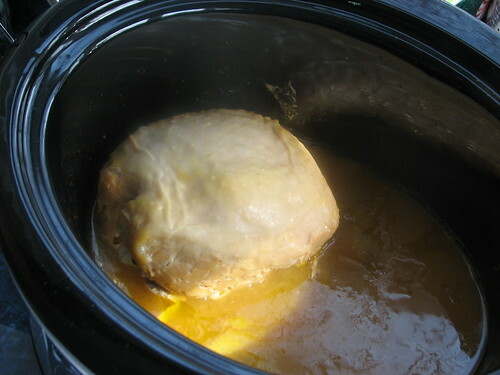 I have this in the crockpot right now, it smells wonderful!! If we have any left over I am making the crockpot turkey tetrazzini on Sunday. YUMMY!! I’ve made this with a little chicken broth instead of the soup – yum! I am planning on making this Saturday!I am very excited to try this because I once made one of these turkeys in my big huge crock pot and it was the first thing i used it for so I had this theory in my mind that you have to put alot of water in with whatever your cooking..So after I came home from work that day it was like chicken soup..Which is how my boyfriend described it..Lol,I hope it turns out better this time!